LIGHTWEIGHT, CUSTOMISABLE STORAGE. 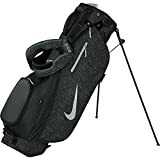 The Nike Sport Lite Carry II Golf Bag is made with ultra-lightweight, durable materials and highly specialised compartments for easy carrying and organisation through your round. PRODUCT DETAILS. Water-bottle sleeve. Matching rain hood included. Zip-off ball pocket. 21.5 centimeter approx. oval top.